The new Affirmative 1225U and 1229U 122-key Terminal Style Keyboard (USB) can be used with any PC or Thin Client Terminal*. It has the same layout as the Twinax or Coax Terminal your are replacing. As a result organizations can look forward to regaining the benefits of true terminal-style productivity. Click here or on image below for large image of keyboard. This 122-key keyboard provides a seamless transition from Twinax and Coax "dumb terminal" green screen terminals such as the IBM InfoWindow 3476, 3477, 3481, 3482, 3486, 3487, 3488 and compatibles from CLI, Decision Data, I-O Corporation, Idea, Memorex and Praim. If you are looking for 122-key PC/5250 DRIVERLESS USB keyboards to connect to USB for PCs and Thin Client Terminals, click here for information on 122-Key Driverless Keyboards. When moving from the 122-key layout to a standard PC keyboard, there are up to 36 new key combinations to be learned to perform the same tasks performed with a single keystroke on the Twinax or Coax terminal. This lack of familiarity can produce a big loss in production and excess errors that would not be occurring if the user had their old, familiar keyboard. Click here or on the image at the top of the page for a larger image of the keyboard. With the Affirmative 1225U and 1229U 122-key keyboards, there is virtually no retraining when moving users from the old Twinax or Coax terminals to the new Ethernet connected device, whether it be a PC or Thin Client Terminal. 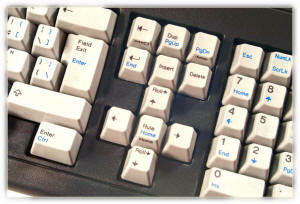 The user will have the same layout and heavy duty "clicky" keystroke feel as on the terminals being replaced. No need to learn the new key combinations a standard PC keyboard would require. This keyboard works perfectly in both the PC and most Thin Client environments. Any keys that have different functions are labeled with both functions. The 5250/3270 keys are labeled in black, jus like a Twinax or Coax terminal. Any PC functions are labeled in blue. The image at left shows this clearly as well as a number of the 5250 keys only the 122-key keyboards have such as New Line, Field Exit, Dup,Roll Up, Roll Down, etc. Some of the 3270 keys include PA1, PA2, PA3 as well as others. With the proprietary Affirmative keyboard driver, you will be able to use and exact terminal keyboard layout. No operator retraining. Simple keyboard map file customization for TN5250e emulations with Keyboard Mapping, such as IBM Client Access and Personal Communications (PCOMM) enhances the functionality. *NOTE: Thin Client Terminals must be able to load a standard PC-type driver on the Thin Client Terminal. For CE.NET and Linux Thin Client Terminals click here for the Affirmative 1221TD Driverless keyboard.